As per the arguments of the first of this two part series discussed, trans-nationalization of far-right extremism presents a threat to Western states, and must be dealt with both unilaterally and multilaterally. Potential unilateral steps states can take to counter far-right extremism include: increasing intelligence gathering of far-right extremist activity, use of counter-messaging, and enforcing laws that prohibit content encouraging violence. States could also work multilaterally to counter the spread of online black markets and to increase intelligence sharing. Many states appear to have neglected the threat of far-right extremism. After the US Department of Homeland Security (DHS) warned the US government against the growing threat of the far-right, “Republicans used [it] to feed… another conspiracy theory, proclaiming that the Obama administration had just deemed conservatives a terrorist threat”. Since then, the DHS has been nearly exclusively concerned with Islamic extremism, with the Trump administration proposing to remove neo-Nazis and white supremacists from the DHS’ ‘Countering Violent Extremism’ programme. In Norway, an official report by the Norwegian security service only months prior to Breivik’s attack stated that far-right extremism did not pose a serious threat to the country. While governments and intelligence agencies should continue to counter the spread of Islamic extremism, they must avoid neglecting far-right extremism as a credible and real threat. It is therefore crucial for states to increase intelligence-gathering efforts on far-right extremist activities, otherwise the security of their own citizens could be greatly undermined. As established in part one of this series, online communication has proved crucial to the trans-nationalization of far-right extremism. To better combat this, efforts should be made to dismantle the online communication networks that far-right extremists rely upon. First, states could unilaterally create or enforce existing laws that prohibit threats of violence, such as those in Canada and the UK. Such laws are crucial, since in 41% of far-right attacks, perpetrators have previously posted explicit comments about their desire to commit violence. Second, states could use counter-messaging. Counter-messaging involves challenging extremist propaganda through media and messaging, and is used extensively against online jihadists. Such efforts could also be expanded to counter far-right extremism. Third, increasing multilateral coordination could help counter the use of websites that host illegal markets online. Such websites are highly difficult to shut down unilaterally as the source code of the website can be downloaded and re-hosted on a different URL. Shutting down these websites requires the combined efforts of numerous intelligence agencies. When the FBI attempted to shut down the largest online drug market, the Silk Road, the site was re-hosted only one month later. However, after working with Europol, the police agency of the European Union, they were able to prevent the re-hosting of the Silk Road. Thus, by having intelligence agencies from different nations cooperating to shut down illegal online markets, this could strengthen the fight against all types of extremism. Sharing intelligence between states is also crucial to prevent the further spread of far-right extremism. Since the September 11 attacks, various intelligence-sharing agreements have been set up to impede Islamic extremism. These existing channels could be expanded to involve information sharing on suspected far-right extremist groups and individuals. Currently, the majority of existing intelligence-sharing agreements are bilateral, such as the UK-USA Agreement formed during World War II. However, to effectively counter extremism through increasing the network of information sharing, states would benefit from strong multilateral cooperation. Such efforts could be started from the ground up, although existing intergovernmental organizations could also prove helpful. For instance, the recent establishment of the EU’s European Counter Terrorism Centre which aims to improve intelligence-sharing amongst the international community. While the coordination of effective intelligence-sharing between many states may prove challenging, benefits would be significant. If governments and intelligence agencies are to effectively tackle the threat of far-right extremism, a combination of unilateral and multilateral efforts are required. Unilaterally, states should gather intelligence, enforce laws prohibiting online threats of violence, and engage in counter-messaging. Multilaterally, states should put in greater effort to shut down websites that host black markets for arms and to share intelligence. This would hopefully improve the ability of governments and intelligence agencies to address the transnational nature of far-right extremism and decrease the threat it poses to the security of the international community. 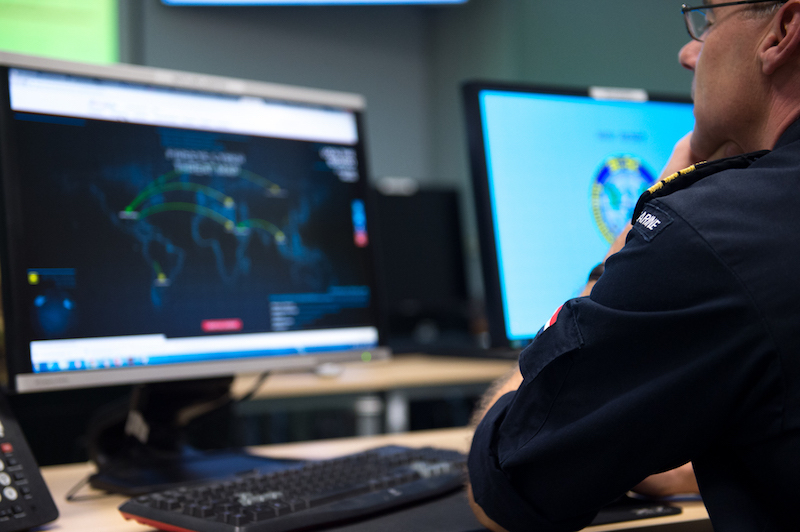 Photo: LTC Alex De Nijs, Dutch Navy from Supreme Headquarters Allied Powers Europe Cyber Division Defense Operation department, scrutinizes a live time cyber threat world map website during Exercise Cyber Coalition 16 in Tallin, Estonia (2016), by SHAPE NATO via Flickr. Listed under Public Domain.